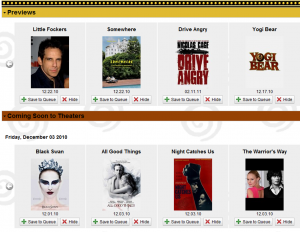 At DVDLater.com, you can see what’s in theaters now and save those movies to your Netflix list. Hover over a title to get a description of it. Once they’re released to DVD, the movies you chose will shortly arrive in your mailbox. Go to DVDLater.com from the Internet Explorer or Firefox browser. It wasn’t working with the Chrome browser when we tried it.